Want to do me a favor? 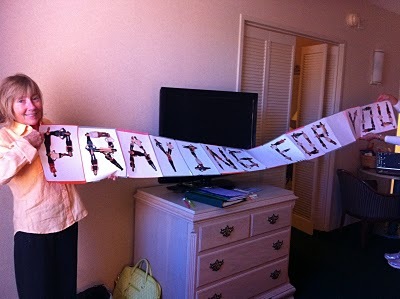 Pray for our friend Turner's mom - her name is Sissy. She's having surgery in Houston this very moment to remove cancer in her throat. She about 5 feet tall, has a BIG and fun personality and is a woman of tremendous faith. Instead of flowers, my friends opted for a picture card that she could keep in her room. Sissy got it this morning. Thanks to our designer friend LeighAnn, who brings these crazy ideas to life! I'm off to spend the weekend with these friends in South Carolina.